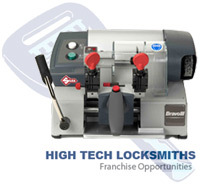 If you are looking for information on the High Tech Locksmith franchise business opportunity, High Tech Locksmith franchises or High Tech Locksmith franchising, then you have come to the right place. 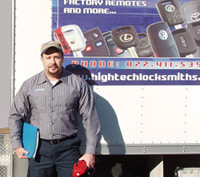 High Tech Locksmiths focuses on serving the automotive industry by specializing in transponder key systems. The percentage of vehicles equipped with these systems has risen from 16% in 1999 to an incredible 85% in 2006. High Tech stands at the forefront of this niche market with its certified training, cutting edge equipment, and proven procedure and inventory systems. A transponder is an electronic chip, transmitter-receiver, with a permanent memory which contains an electronic code. Hidden in the head of the key, the transponder communicates with the car's computer, and when it receives the proper code, it allows the vehicle to start. Although the transponder is located in the car key, it communicates with the car's computer, known as an electronic control unit (ECU). Unless the two units send and receive the same code, the vehicle will not start, even if the proper mechanical cuts have been made on the key. We are looking for ambitious and self-motivated people who want to be part of this very exciting field. Previous locksmithing experience is not necessary, but a willingness to learn cutting-edge technology is essential. Working as locksmiths since 1992, we have grown our automotive specialty division from a single vehicle in 2003 to a current nationwide presence with a fleet of trucks to serve the transponder key needs of the automotive industry. Through innovation, streamlining and stellar customer service we have become the dominant player in transponder key services. Our central offices are based in Miami, with facilities throughout the U.S. We are a well recognized and established name in automotive key services.